Share Internet Software, Software to Share your Internet through Wi-Fi. This is an easy-to-use software that turns any LAN-connected PC or laptop into a Wi-Fi wireless access point. So anyone nearby can surf the Internet through your sharing. Also, your iPhone, PDA, mobile or what ever, can enjoy the Internet by connecting to the wireless network broadcasted by Virtual AP. A great idea to cut down your mobile bills, isn’t it? It turns one of your laptops into a Wireless Access Point(WAP, or Wi-Fi router or Wi-Fi gateway), other laptops can connect to the Wi-Fi network to surf Internet. Your iPhone, PDA or other Wi-Fi devices can enjoy the wireless network created by Virtual AP. The wireless network created by Virtual AP is security-enabled. Anyone who wants to connect MUST have the network key (Password). One button to start, one button to stop, that’s all. It is very simple, one-click sharing. You even don’t need to read the manual. It turns your laptop into a Wireless Access Point(WAP), without any third hardwares. Share your 3G connection with your family. Share your ISDN connection to your another laptop or PC. Share DSL or ADSL to your another laptop or PC. While on business trips or attending conferences, there may not always be multiple Internet connections available for all participants to take advantage of. 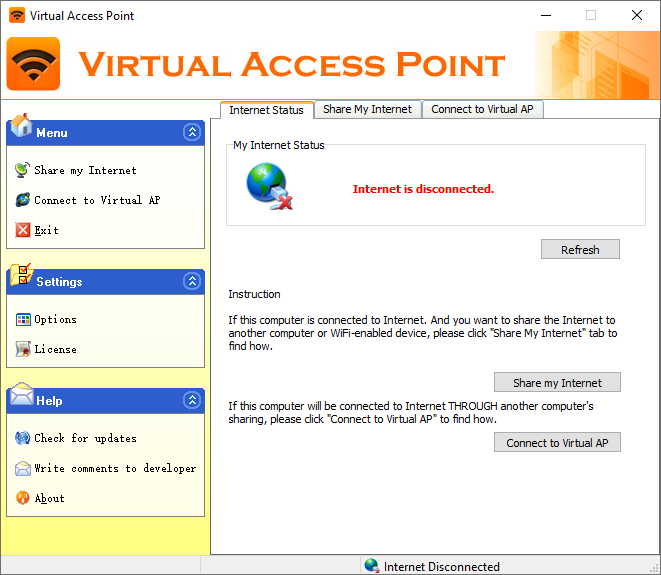 Using Virtual Access Point software you can share Internet access with co-workers during meetings or conferences in locations where there is just one Internet connection such as a hotel or conference centre. This will work in locations which offer Internet access connections through an Ethernet connection. Ethernet enabled Internet connection in the location. Two or more aptops with wireless adapter card. Virtual Access Point software installed on these laptops.